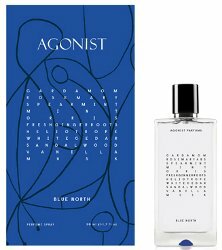 Swedish niche line Agonist Parfums will launch Blue North, a new unisex fragrance. A fresh energizing fragrance that pays tribute to the mystery and beauty of the cold Northern season. An olfactory trip that lifts you to the great blue skies, the frosted Nature, imagining to go to sleep with open windows under a thick duvet – as Nordics do – keeping your body warm and thoughts fresh with a cool breeze that wakes up your senses in the dark morning. It strikes you and instantly leaves with an embrace of the Blue North. The notes include cardamom, rosemary, iris, spearmint, mint, ginger, heliotrope, cedar, sandalwood, vanilla and musk..
Agonist Blue North will be available in 50 ml.